For years, cooler-heaters have been made with a "one size fits all" approach that limits customization and often adds unnecessary cost. That's why CardioQuip created the MCH Series to be modular in design. Customize your MCH unit with the modules below to fit your specific needs. Tired of hauling ice buckets to the OR? The CardioQuip Refrigeration Module replaces the lid on the MCH-1000(i) with an enclosed condensing unit that forms a block of ice in the tank. With room-temperature water, the Refrigeration Module will chill the water to 3°C in about one hour, and begin to form ice in about 90 minutes. Click here for a timelapse video. With the Cardioplegia Shared Channel Module, there's no need to add an additional unit for Cardioplegia. In the dual-shared channel arrangement, the main circuit delivers fully temperature-controlled water, and the secondary unit can be toggled between cold water (directly from the ice tank) and the main circuit. The Cardioplegia Shared Channel module is a perfect complement to the Quest MPS™, increasing the cooling capacity of that system. In today's perfusion climate, maintaining water quality in the OR is critical. We introduced the Dripless Anti-Microbial Hose Kit to offer a clean and safe way to keep cooler-heater water away from the OR environment. Dripless Connectors at both ends prevent water leakage and Silver-impregnated antimicrobial PVC tubing resists biofilm formation. Working with a patient blanket? Add the Blanket Connection Module to your MCH-1000(i) to provide external warming or cooling. Applications include prevention and treatment of hypothermia, fever reduction, and general patient comfort. CardioQuip's lightweight stainless steel MiniCart is designed to increase the portability of your MCH-1000(m) compact unit. The MiniCart is fully customizable to suit your specific needs. Want to prolong the life of your ice? 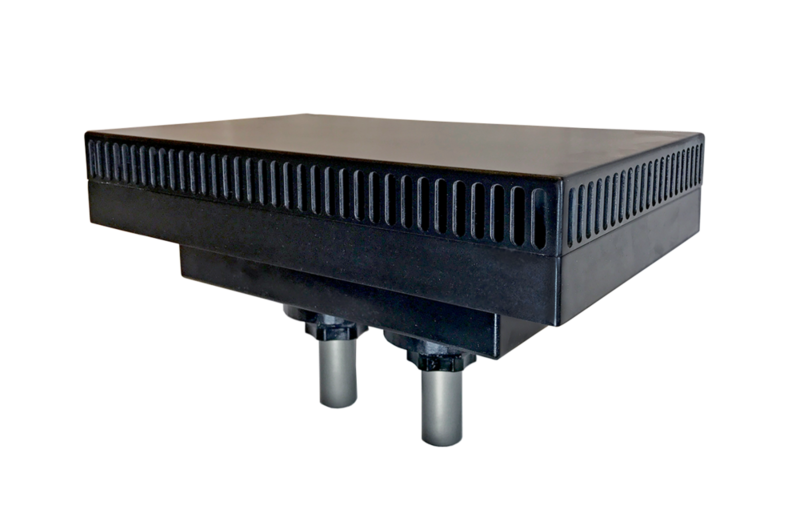 The Thermoelectric Cooling (TEC) Lid Module replaces the lid on the MCH-1000(m) and provides 100W of thermoelectric cooling power. Need to move your mini around? Add portability to the MCH-1000(m) with the Wheelset Option module. The wheelset option features fully lockable medical grade casters mounted on a stainless steel frame. Copyright © 2019 CardioQuip. All rights reserved.